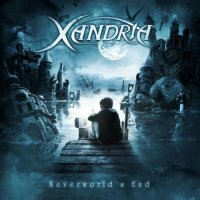 Xandria is a symphonic metal band from Germany formed by Marco Heubaum in 1997. There has been several line up changes especially at singer with previous vocalists including Lisa Middelhauve and Kerstin Bischof; the current vocalist is Manuela Kraller. The band released their first album in 2003 entitled ‘Kill The Sun’ with ‘Ravenheart’ and ‘India’ in the following two years. Their last record came out in 2007 entitled ‘Salome-The Seventh Veil’. Now in 2012, Xandria’s latest offering ‘Neverworld’s End’ is unleashed. ‘A Prophecy Of Worlds To Fall’ opens with a gothic choir that gives way to a massive chord progression. The whirlpool of sound eases in the verse as Kraller first appears with her gloriously operatic voice. She really turns it on for the chorus showing a wonderful array of power and pitch. It’s worth mentioning the crescendo of the vocal performance sends shivers down the spine. Another thundering riff drives ‘Euphoria’ but this time it continues powering through the verse as well. There are heavier tracks like ‘The Dream Is Still Alive’ where Heubaum lets loose a riff which doesn’t sound dissimilar to an engine revving away. ‘Cursed’ kicks off with a haunting composition on the violin before a Marilyn Manson like riff fires up, complete with snarling male vocals. But it’s ‘Forevermore’ that is the pick of the album, (just beating the opener), and it’s a beautiful symphonic vehicle. The choir starts first before silky vocals from Kraller. As the chorus erupts the most amazing riff on the guitar hammers out, sounding something like an automatic machine gun pounding away. Kraller projects an amazing array of sound from her throat as the song reaches its peak. One other notable song is ‘Blood On My Hands’ which is slightly heavier in its crunch. Another thudding riff leads to a soft verse of just rhythm and Kraller’s lyrics. As with ‘Forevermore’ the chorus is seriously infectious and contains a mixture of guitar, Kraller and the choir. The one word to describe this is sensational. Following hot on the heels of Nightwish’s latest opus is this absolute symphonic gem that in its own ways may be every bit as good. There are obvious Nightwish comparisons, especially given the vocal style of Kraller. But whereas they concentrate more on an all-round sound with keys and orchestra, Xandria is more power by the riffs and choir. Kraller has an amazing operatic voice that is rich and powerful and for her first album with the band, she sounds supremely confident and literally raises the hairs on the back of your neck at tines. Heubaum has dreamed up some immense progressions and riffs on the six string and then surrounded them with some wonderful compositions and lyrics. The mixing and production work gives the album a polished clear finish although it is pushed to the limit with the wall of sound in places. Basically this album is truly wonderful and an early contender to be in this reviewer’s top five for 2012.